This album is a lot like Neil Young’s career: Far longer than common sense or popular consensus would have dictated, with some mountainous peaks and head-scratching valleys alternating throughout, as Neil’s voice, guitar and unerring funky charm lead the charge from start to finish. The latest installment in Neil’s ongoing live Archives series, this 2CD set is culled from a handful of performances featuring Neil backed by a full band of the usual suspects, old friends and a horn section. The 80s are often erroneously remembered as a decade when Neil released a series of studio LPs ostensibly to annoy his new label president David Geffen. Though history shows Neil did indeed unveil a string of records very unlike the rootsy Folk Rock that first put him on the map in the previous decade, closer inspection of his recorded output up to that point reveals that Neil’s early records had just as many bizarre and uncategorizable detours as his much-maligned 80s releases. Granted, one suspects few with half a brain would list Trans, Life, or Landing On Water among their favorite Neil Young albums. (That decade also saw the birth of digital recording and in its infancy that technology did not serve Neil well.) Though it was a decade that would see numerous spotty releases from Neil, the 80s were not devoid of high water marks for the man. This writer would argue for 1985’s Old Ways forays into traditional country as one of the most underrated albums of Young’s career. It’s hard to not love Neil’s 1983 video for “Wonderin’” from the album Everybody’s Rockin’. And lastly, in defense of Neil’s 80s output, one need look no further than “Keep On Rockin’ In The Free World” for one of the great anthems of the man’s entire career. Marketed at the time as a Big Band / Blues album, 1988 saw the release of This Note’s For You and the video for the title track enjoyed a brief moment in heavy rotation on MTV as Neil sang of his refusal to be a corporate shill. Neil Young christened his touring band the Blue Notes and Bluenote Café is culled from their live performances in 1987 and 1988. 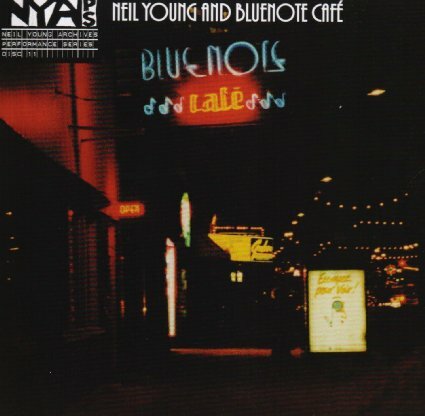 On the whole, Bluenote Café is a nice long romp through some otherwise unfamiliar material, as Neil is clearly reveling in fronting a raggedy, rough and tumble Blues band of brothers. There is frankly nothing here for the casual fan. The bass guitar tone on this recording won’t win any awards I predict. And the horn section has more than its share of amateurish moments, flat notes and miscues. But that again is part of Young’s half-baked masterplan, as his horn section includes pedal steel player Ben Keith and Neil’s long-time guitar roadie Larry Cragg on saxophones. (You can practically see the mad scientist smirk on Neil’s face as he handed these masters of stringed instruments the horns they would play on this tour.) As has become typical for Neil, he indulges fully in his folly here, pounding out one stomping Blues number after another without a single concession granted to those who might have fancied a Greatest Hits type show. One could certainly make a case for “Tonight’s The Night” being among Young’s more familiar numbers. But the nearly 20 minute version that closes out this set is so indulgent and epic in length that even the casual fan who recognizes it might not necessarily make it through to the performance’s breath-taking conclusion. It takes up all of side 8 on Bluenote Café’s vinyl release, and it is easily among the more adventurous mega jams in Neil’s recorded output. Elsewhere you’ll find no fewer than seven previously unreleased songs, in addition to an early version of “Crime In The City”, a song that would resurface in a very different form on 1989’s Freedom LP. A worthy addition to Neil’s live archive, Bluenote Café reveals yet another previously unseen side of a multi-faceted artist who has fearlessly followed his unpredictable muse down more inspired detours than any other of his generation. Last year Neil released an album of him singing thinly veiled love songs to Daryl Hannah and odes to the environment backed by a huge orchestra. And earlier this year, returning to the classic Country Grunge sound he first explored with Crazy Horse, Neil Young + Promise Of The Real released The Monsanto Years, an album that fearlessly spoke truth to power, taking on the blatant corruption and obscene corporate influence in American politics that has all but destroyed the American family farmer. Bravery personified in artistic expression and an ungodly guitarist, Neil Young shows more pure courage and fierce dedication to his beliefs and ideals in his art than anyone else I can think of.